Regular readers may remember a few months ago when I blogged about Health Canada's plan to allow the food industry to fortify junk food. That blog led to the story being picked up by the Canadian Medical Association Journal and then the mainstream media and ultimately led to a retraction of the policy. I had thought the issue was dead and gone but apparently when Health Canada hit bottom on junk food fortification they began to dig furiously. 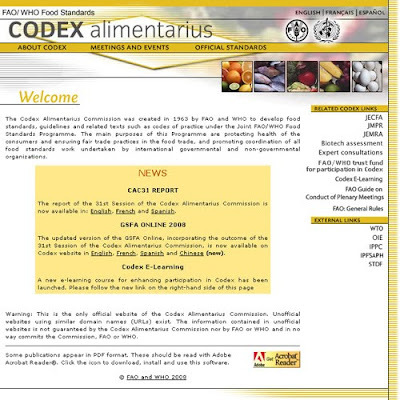 To explain the latest Health Canada nutritional debacle I need to provide you with some background into something called the Codex Alimentarius Commission (Codex for short). "The Codex Alimentarius, or the food code, has become the global reference point for consumers, food producers and processors, national food control agencies and the international food trade. The code has had an enormous impact on the thinking of food producers and processors as well as on the awareness of the end users – the consumers. Its influence extends to every continent, and its contribution to the protection of public health and fair practices in the food trade is immeasurable." "When formulating national policies and plans with regard to food, Governments should take into account the need of all consumers for food security and should support and, as far as possible, adopt standards from the Food and Agriculture Organization’s ... and the World Health Organization’s Codex Alimentarius"
Basically the Codex serves as the reference standard for national nutrition policy decisions the world over and with 94% of the world's nations being members representing 99% of the global population there truly is no more important nutritional document on the planet. "There should be a demonstrated need for increasing the intake of an essential nutrient in one or more population groups. This may be in the form of actual clinical or subclinical evidence of deficiency, estimates indicating low levels of intake of nutrients or possible deficiencies likely to develop because of changes taking place in food habits." Simply put, the Codex thinks that adding nutrients to foods should only be in response to true population based need. Seems pretty reasonable to me. "expand their applicability to include the discretionary addition of vitamin and mineral nutrients to foods for purposes beyond the prevention or correction of demonstrated deficiencies." Translation? Canada wants the Codex to abandon the general principle that foods should only be fortified when there's a demonstrated population based need. Further translation? Canada wants allow for food manufacturers the world over to fortify food at their discretion. "changes in lifestyle and dietary habits have also prompted a growing interest by the food industry to provide consumers with a wider selection of fortified foods"
Another arugment in favour of allowing for by definition unnecessary fortification is that some jurisdictions have already allowed for this type of fortification. Great arguments those. Let's change the Codex so that the food industry can sell consumers a bushel full of fortified junky foods because there have been a few member countries where this is already occuring. What's next? The police lobbying to increase speed limits on highways because there are already a bunch of speeders? "the increasing, and sometimes insufficiently controlled, use of food additives has become a matter of public and administrative concern"
"The Principles aim to prevent the indiscriminate addition of esential nutrients to foods thereby decreasing the risk of health hazard due to essential nutrient excesses deficits or imbalances." "This will also help to prevent practices which may mislead or deceive the consumer." I guess Health Canada doesn't care as much about the consumer as it does about the manufacturer. and that the review of Codex’ general principles will serve to allow for a debate at the international level as to the types of constraints that need to be placed on voluntary fortification. Some however might wonder why it is Health Canada, when faced with a global epidemic of obesity and literally tens of thousands of supermarket products, is hoping to enable the world’s food manufacturers to produce more “food-like” substances and potentially shift dietary consumption away from healthier whole-food choices. Broccoli is after all, already very well fortified. "I have tried my best to locate a suitable spokesperson to speak on the topic, but unfortunately none are available."